Home Self-Funding Candidates Bet On Themselves: Did They Win? Self-Funding Candidates Bet On Themselves: Did They Win? 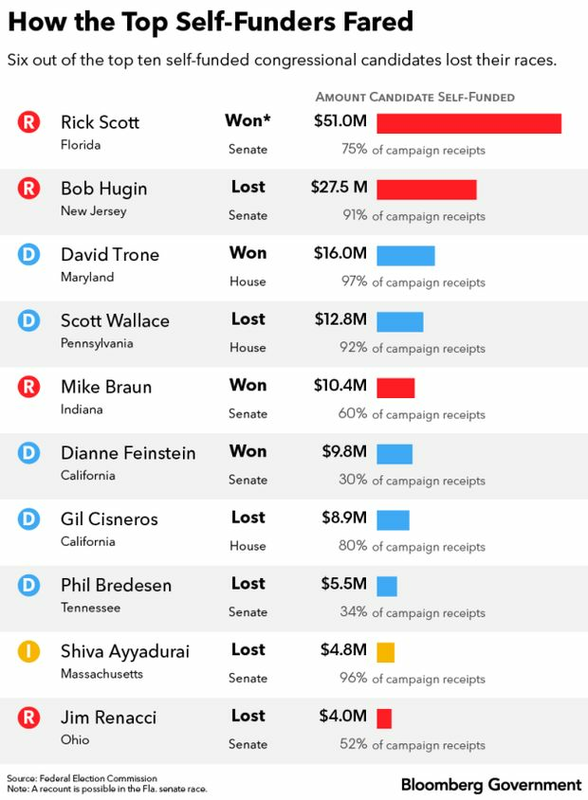 Rick Scott set a record for a pay-your-own-way congressional campaign by spending more than $51 million to win a Senate seat from Florida. The Republican governor and former businessman defeated incumbent Sen. Bill Nelson (D) in a race that may end up ranking as the most expensive Senate contest ever once all types of spending are tallied. Cumulatively, congressional candidates dipped into their own bank accounts for more than $200 million in this cycle. Campaign contributions to federal candidates are limited, but the Supreme Court has ruled that candidates can spend as much of their own money as they want. The post Self-Funding Candidates Bet On Themselves: Did They Win? appeared first on Bloomberg Government.